You've probably noticed that the stones found at the bottom of lakes and rivers are often slippery to the touch. Were you to scrape some of the thin, slippery film off the stones and examine it under a high power microscope, you would find a surprisingly diverse assemblage of microscopic organisms - bacteria, fungi, algae and protozoans. The composition of this "biofilm" plays an important role in freshwater ecology. It is a souce of food for many of the invertebrates found at the bottom of lakes and rivers and it also helps in the natural breakdown of pollutants. Too much of the wrong sort of biofilm can interfere with fish spawning or smother larger plants. Consequently, an ecologist can learn much about the health of a river or lake by looking at the organisms present in this biofilm. Diatoms are one of the most conspicuous groups of organisms in stream and lake biofilms These are microscopic plants which can be found in wet places – freshwater and marine - throughout the world. They are especially abundant in the plankton of oceans, and scientists have estimated that they are responsible for about twenty per cent of all the photosynthesis on the planet. This exceeds the contribution of all the tropical rainforests combined. They are, as a consequence, immensely important whilst, paradoxically, being almost completely unknown to most people. 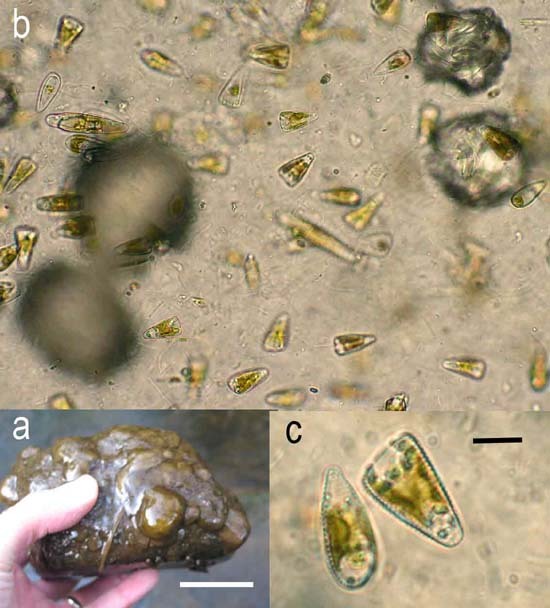 a) Gelatinous growths of diatoms on a rock in a stream in Co. Fermanagh, April 2007 (scale bar: 5 cm). When observed under the microscope, this turned out to be composed of an almost pure growth of Gomphonema olivaceum (b and c: scale bar: 10 µm). Just occasionally you can see a growth of diatoms with the naked eye. Sometimes, submerged rocks in streams have obvious growths in Spring, as in the illustration opposite, but most of the time they are invisible. You need a powerful microscope for the true beauty of diatoms to be revealed. 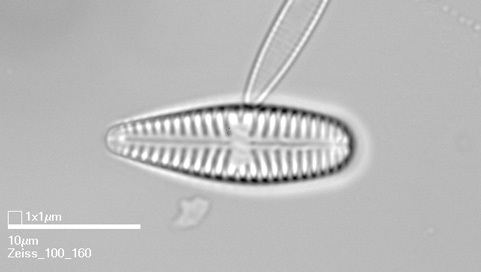 Two characteristic features of diatoms are evident from this illustration: first, the cells are encased in a ‘shell’ (technically, a ‘frustule’) made of silica, which gives them a glass-like appearance (imagine a microscopic piece of crystal glass) and, second, they are a yellow-brown colour, not the green that one expects of a plant. This is because they share pigments with seaweeds such as the wracks which are common on our seashores. People who study diatoms don’t usually try to identify the live cells. Instead, we follow a series of steps to remove all the organic matter from the cells so that we can look in more detail at the frustule. This lets us see a lot more detail which helps when identifying the species. We can see from this illustration that the frustule has a series of fine lines and markings, which are different for every species. Gomphonema olivaceum viewed under a high-power microscope (1000x magnification). An image from the ADIAC collection. 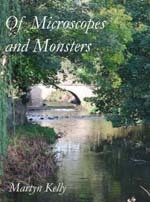 There are over 2000 species recorded from freshwaters in Britain and Ireland. This number is almost certainly an under-estimate of the real situation. The types of diatoms that are found in a particular place can tell a story about the conditions that were present when the diatoms were alive – information that can be extremely useful to environmental scientists, archaeologists and forensic scientists.